I haven’t been able to write for awhile because I’ve been abducted by my apothecary. Just like a new-born child needs to be nursed and fed, I’m steadily nursing this small business so that one day it can stand up on its own two feet. For those of you that are in the throws of your own small business or thinking of starting one, read this hilarious article. After a hectic month of going to markets, making herbal preparations galore, attending a festival, and integrating new things into my life, I was given the opportunity to slow down this weekend. Normally when I slow down, I am privy to flashes of inspiration by some of my favorite friends, the plant allies. While walking along the back pond, I visited with the Cypress. Having dropped all of her lovely dried, feathery, amber leaves in a carpet around her feet, she stood there brilliantly naked and bedazzled with the remanding, resinous cones. Last year I stood by this same tree and for the first time, opened up one of her cones and smeared the yellow-amber resin on my palm and took drew in a long inhale of its fragrance. The smell was simply divine and I wished to find a way to incorporate this scent into an herbal preparation. Flash forward a year, today was the day. I had been meaning to make a pine pitch salve. 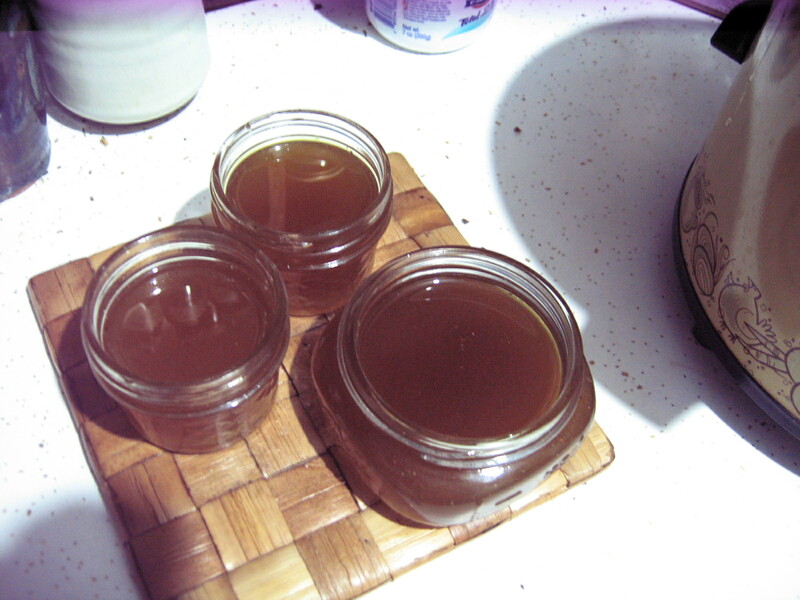 So, I decided to marry the two and make an all-around powerhouse salve for the Winter months. Most resins have similar properties as they tend to protect trees where there are open wounds or exposed areas: anti-viral, anti-fungal, and anti-bacterial. Cypress resins and resin-infused oils have a long-standing history and tradition. 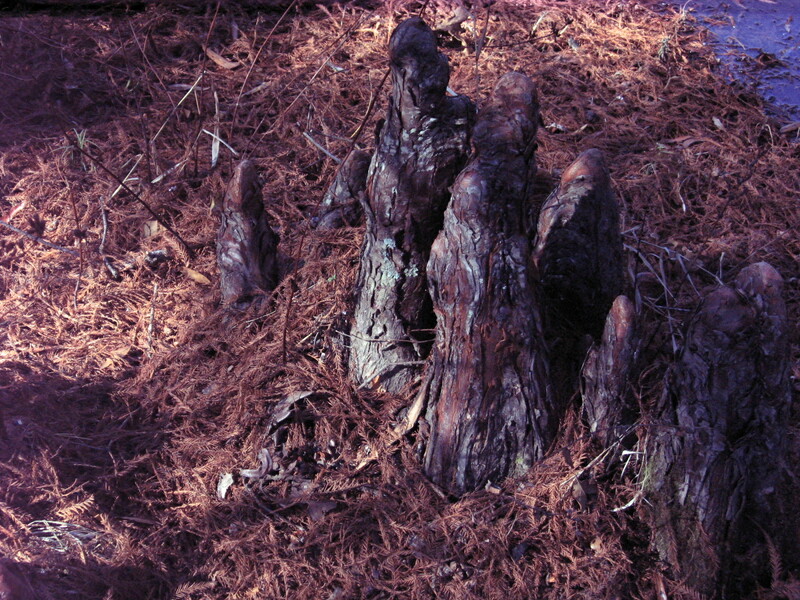 The species of Cypress that I am working with is Taxodium distichum or Bald Cypress which is common in the Southeast. Found throughout the temperate world, all cultures that lived around Cypress integrated its plant material into everyday and ceremonial life. 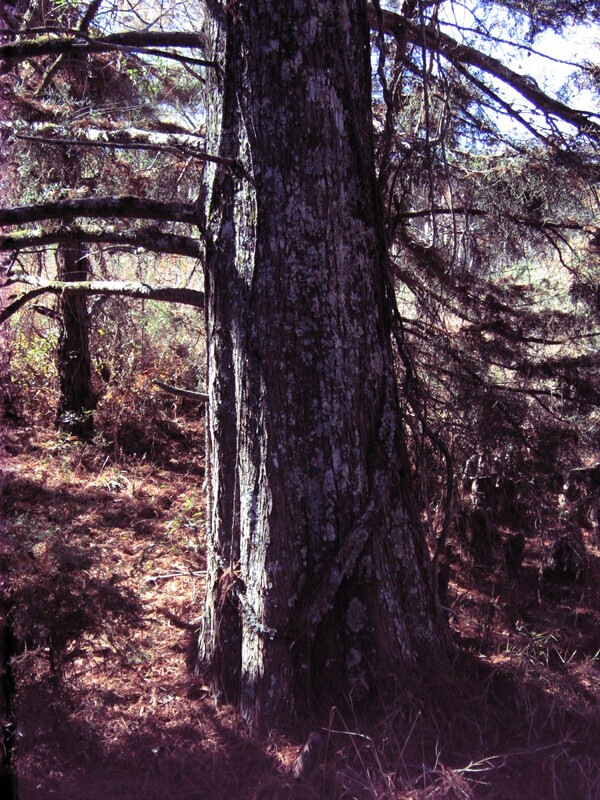 Pine also has a long-standing tradition of use. It’s needles, male catkins, bark, resin, and sap have all been used for thousands of years wherever pine is found. For the salve I made today, I used pine resin. A local beaver likes to gnaw on the cambium layer of bark (the green layer just below the brown outer layer) which provides me a constant (and non-invasive) flow of fresh resin. Overall, I love using propolis (which is resin transformed by bees into a hive product) and resins internally and externally. 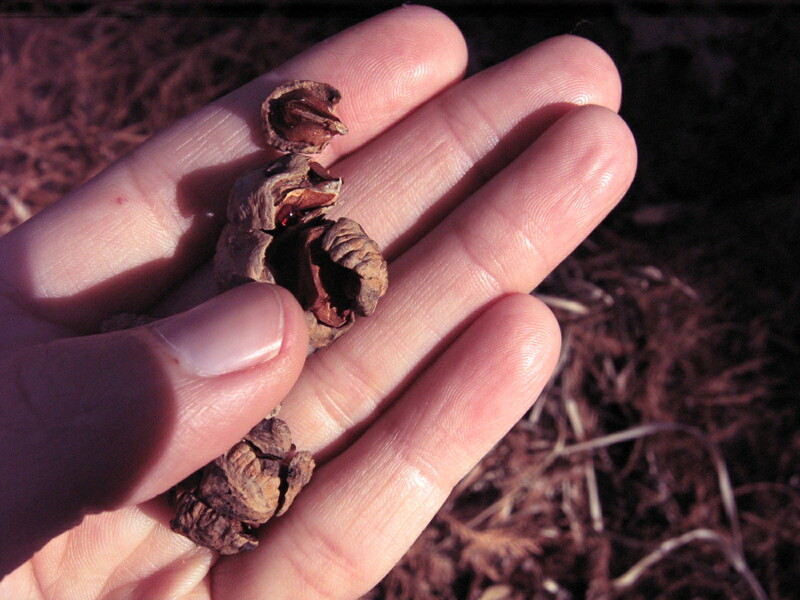 There is a reason trees create this potent substance for their overall health and well-being. To me, resins are about protection, endurance, harmonizing, and creating and maintaining energetic boundaries. Basically, the resin is coating the tree and protecting the wound so that the tree does not become infected. The large clumps that you see are the ones that I collect as they do not affect the area covering the actual wound (and the ability for the tree to heal). 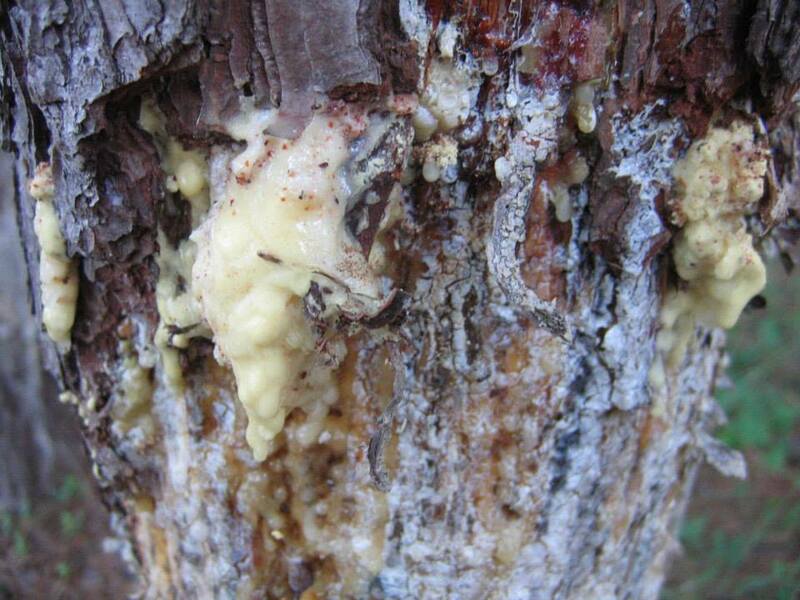 When pine resin is infused into oil and thickened with something like beeswax, it is called pine pitch salve. It’s known for drawing out embedded objects in the skin (glass, splinter, etc), bringing circulation to the area it is rubbed on (very warming), increasing the immune response, and wound healing. Read more about this on Kiva Rose’s lovely blog. 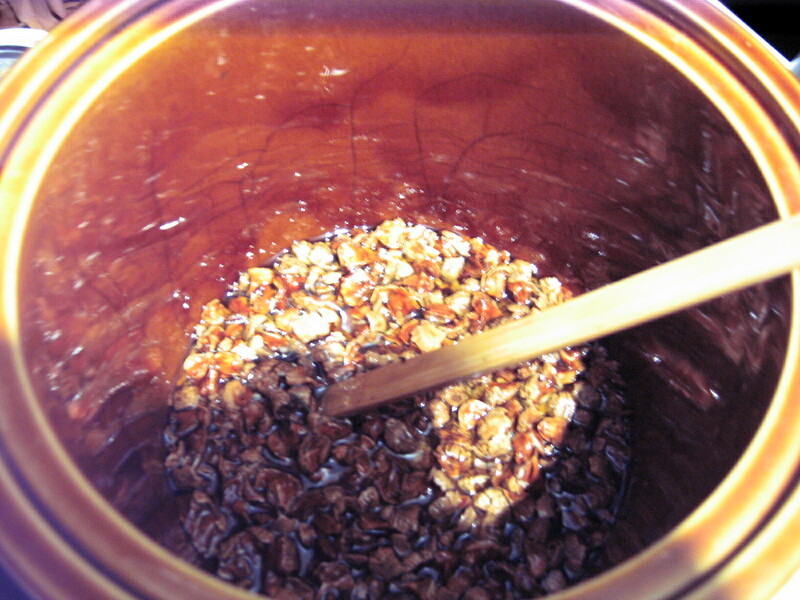 # 1 – I simmered the cones in 1 pound of locally rendered pastured beef tallow and 1/2 cup EV olive oil on low in the crock pot for about 4-6 hours and stirred regularly to ensure that the resin in the cones mixed well with the fats. # 2 – While the cones were simmering, I collected resin and tossed the resin into a plastic bag and then into the freezer (to later break up into smaller chunks with a hammer). 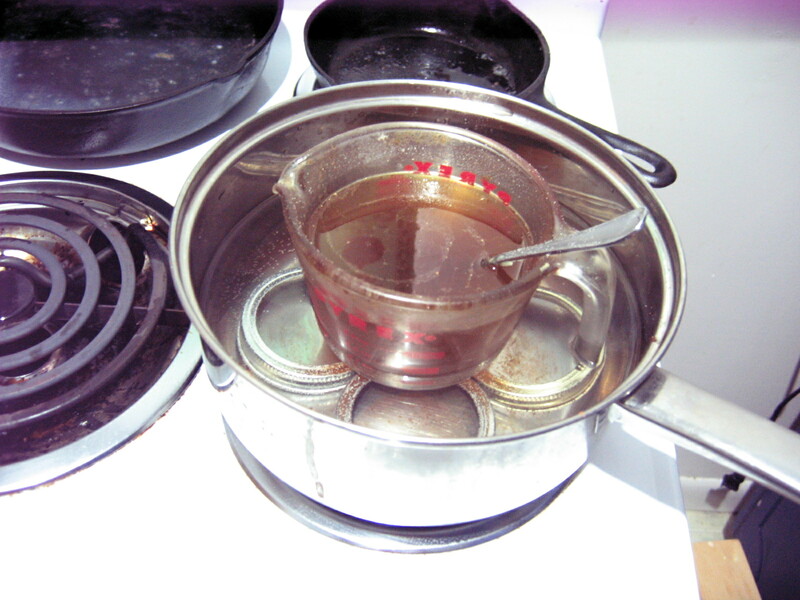 # 3 – I strained the oil into my pyrex measuring cup and set up an easy-breezy double-boiler and got things boiling. (Note the ball jar rings underneath the Pyrex). 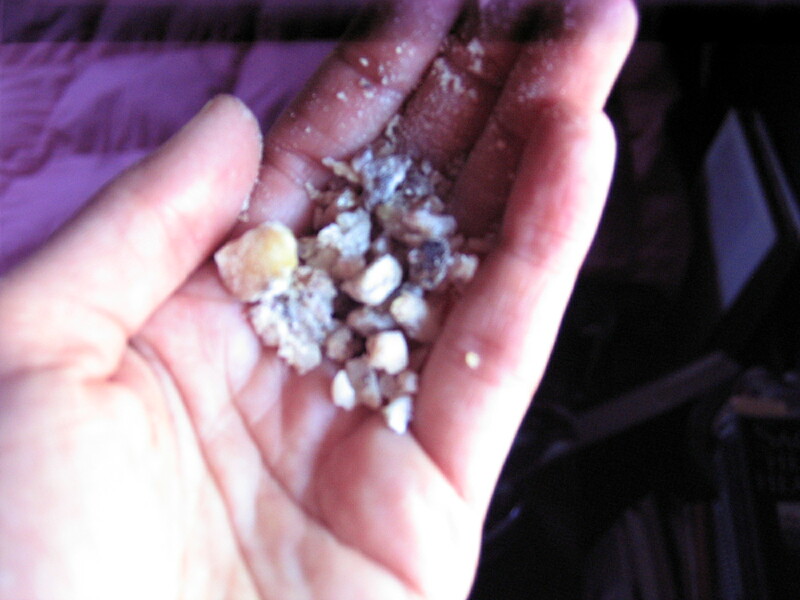 # 4 – I then took the pine resin from the freezer and lightly tapped the resin until it broke into little pieces and powder. Now, here comes the folk herbalist in me. I put about 25 large pinches of pine resin into the cypress infused oil/tallow. I tried to put mostly powdered resin in there so that it would infuse easily. 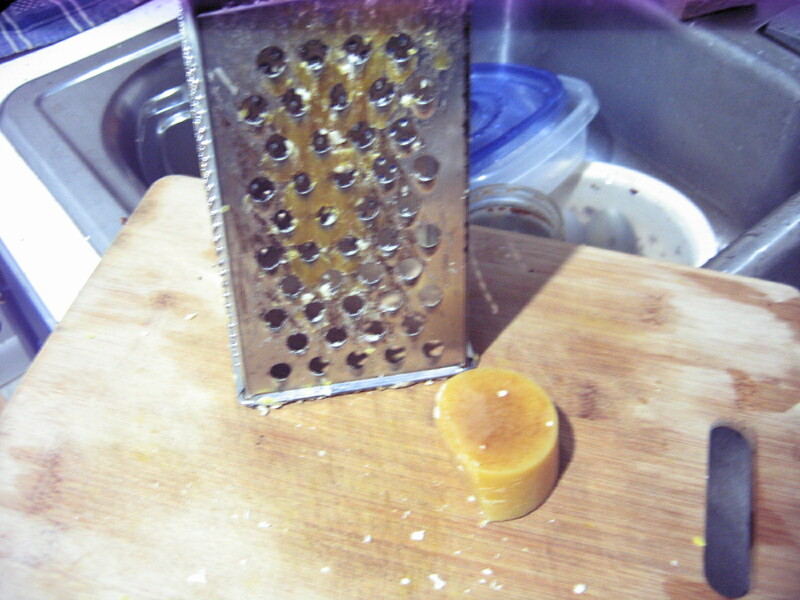 # 5 – I shaved some local beeswax (a fluffy 1/2 cup) and placed it in with the salve. You don’t have to use that measurement as you may want yours a different consistency. Use the freezer test to figure this out. I simply take a ball jar lid and drip some of the salve on the lid. I then place it in the freezer for a minute to harden. I take it out and if I like the consistency, that’s it! 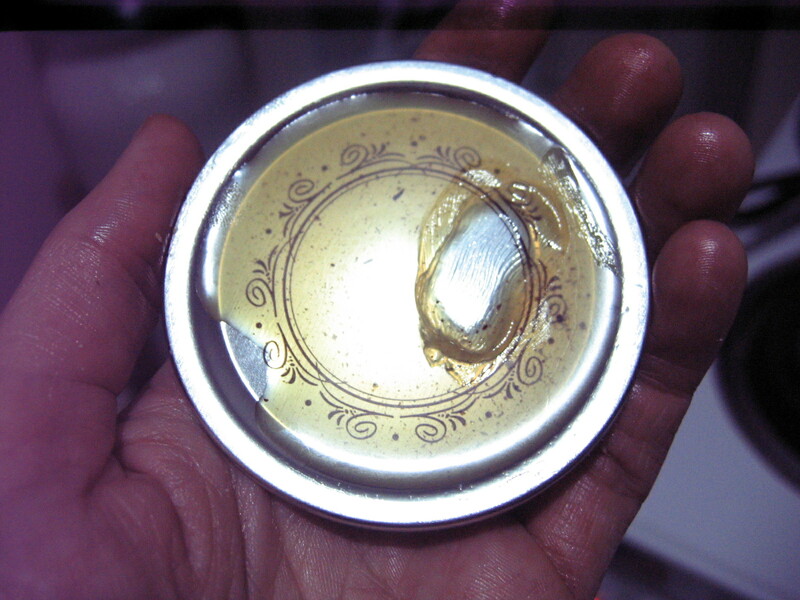 If not, I add more beeswax (picture of tester lid below). # 6 – When the desired consistency is arrived at, strain into glass containers. (Side note: to get resinous material off of hands and kitchenware, simply rub them down with olive oil and soap). Throughout the entire experience I was nibbling on resin (yes it does coat your teeth at first, but it eventually wears off) and slathering infused oils and the freezer tester portion of the salve on my arms, face and legs. 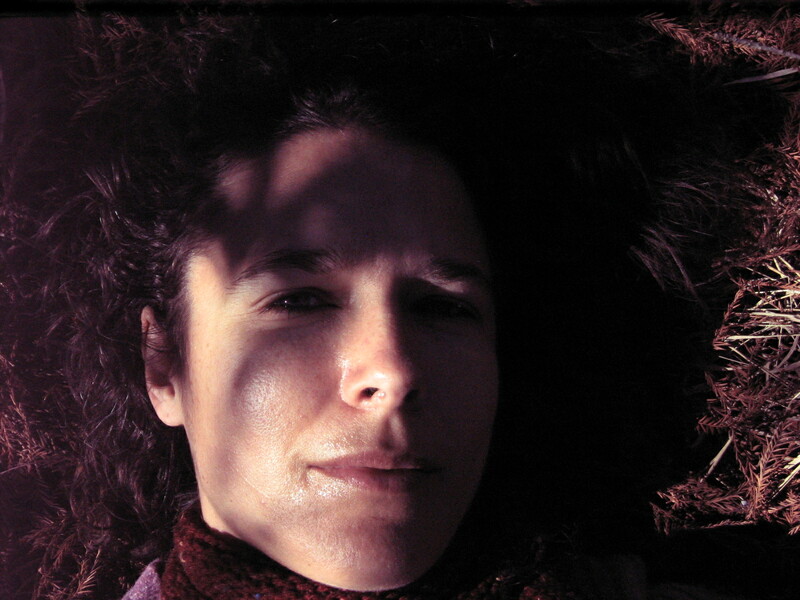 I am thoroughly infused with tree goodness now and smell like a forest ~ yum! Update from the next morning ~ I just got out of the shower and lathered up my body from head to toe with this warming, forest salve. Yes, yes ~ most salve are intended for spot treatment…but…oh my! This is the creamiest, most divine salve I’ve ever made that just smells of the deepest layers of forest fragrances. So in love.